Alcatraz. The island prison that kept escape attempts at bay using the threat of the endlessly eddying currents and bone chilling waters. Alcatraz has a fascinating history as a civil war fort, military installation, military prison, federal penitentiary, site of an American Indian occupation and national park. It has captured the imagination via Hollywood films and was no doubt part of the inspiration for Azkaban. It's also a very popular but challenging swim. I heard about it, had friends who moved to San Fran whom I wanted to visit and wanted to sign up. Then my partner in crime, Jacki signed up and I had to jump on board. The same factors that kept prisoners with nothing to lose out of the water make for an interesting swim. 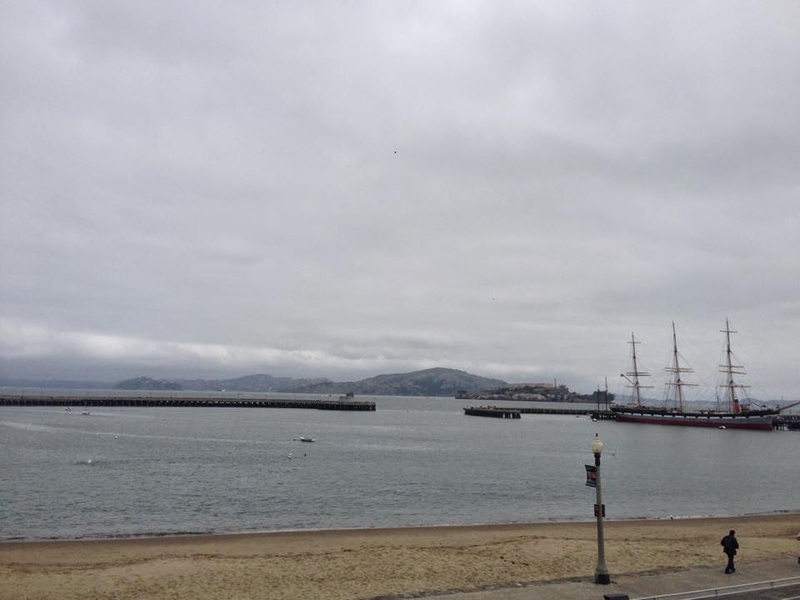 San Francisco Bay is actually a tidal estuary. So the water is pretty opaque, constantly moving and cold!! Even in summer it was 54-60F or 12-15.5C depending on the tide. Bondi hasn't gotten that cold in years. 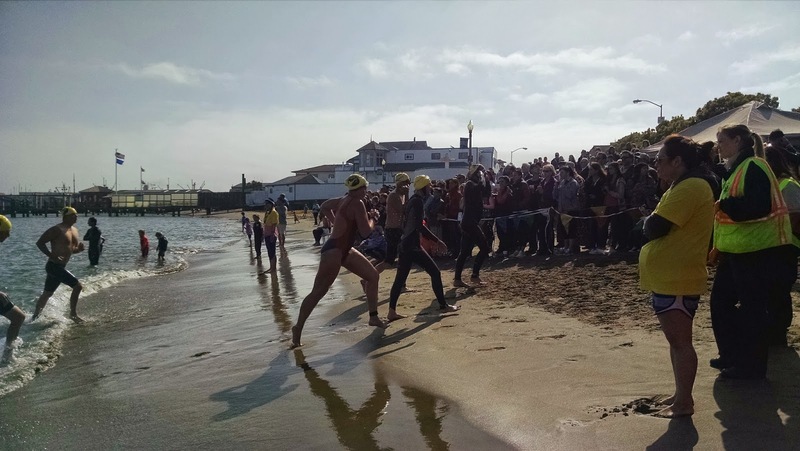 The coldest ever Coogee swim was 15.5. Balmoral gets down to 14 and I make a point of trying to swim there over winter. 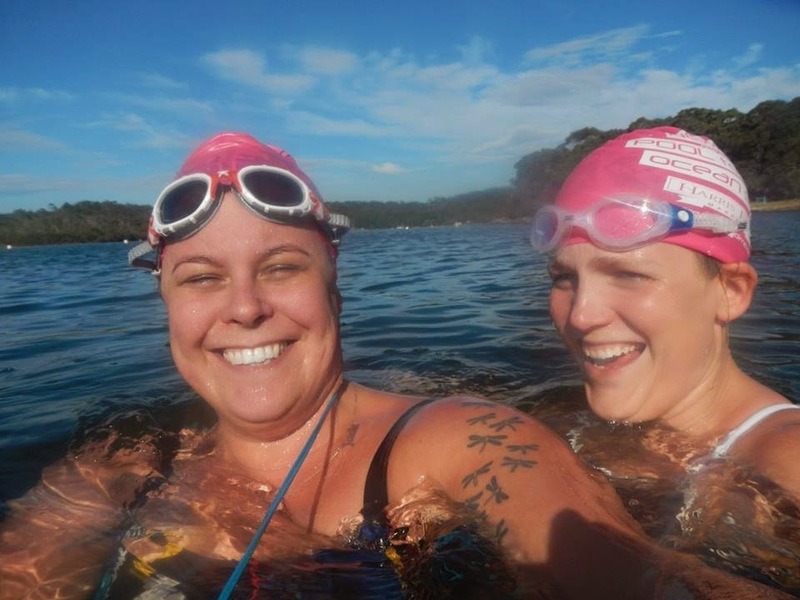 We did a delightful session in Lane Cove national park (16 degrees) and Manly Dam was down to 15.5 just before I flew out so I did 2 sessions there. And then swam in LA where it was 20-21 degrees. 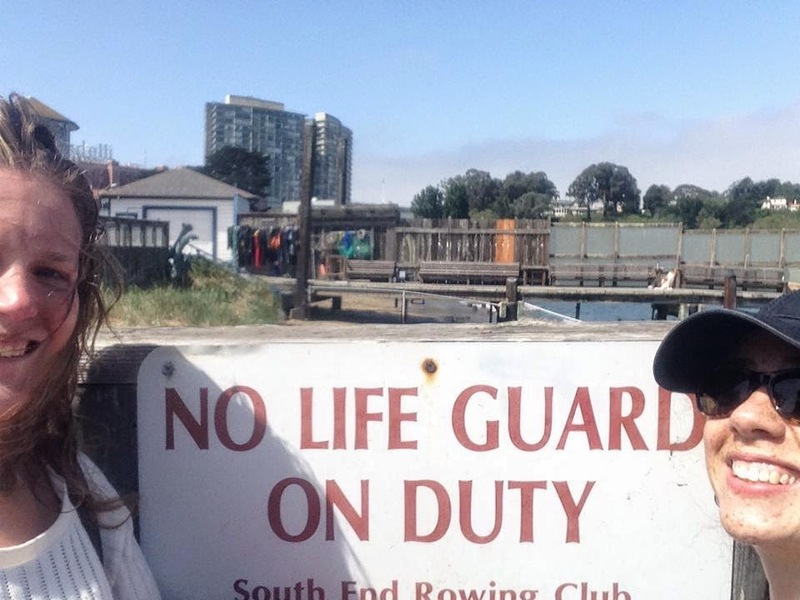 I knew Icebergs had a relationship with South End Rowing Club (SERC), one of two famous historic swim clubs in SF's Aquatic Park and made a beeline for there when I arrived. They could not have been nicer. I interrupted a gentleman on his way to his swim. If you get between me and a swim woe betide you! But he was just so helpful and friendly. Recovery session – through the concrete pylons of the piers (to counter the worst of the flood tide) to the marina where a friendly seal joined us and then back with the current. Squee! There are no words to describe just how gorgeous and giving SERC were. They were the key to my success. Acclimatisation was a joy, not a chore thanks to the friendly folks, hot showers and sauna! I still can’t believe how much I enjoyed swimming in water colder than I had ever experienced (except maybe in Cornwall, in which I lasted exactly 1.5 minutes). Race Day dawned very grey. Simon of Icebergs / SERC fame assured us the sun would break through. Never doubted him for a second. The worst part, hands down, of this race is jumping off the ferry. This is where people tend to panic. And not without reason. You’re jumping from a reasonable height into bloody cold water. It’s best to try and minimise your descent into the water and jump off like scuba divers – arms and legs akimbo. Hard part over, Jacki and I headed to the start line which was about 500m away. I couldn’t believe I was swimming just metres from the wharf I had stood on two days earlier to start my Alcatraz tour. The same wharf where inmates landed to start their sentence. The same wharf where American Indians landed to claim Alcatraz and highlight the indignity of their situation. Just an incredible honour. As I was revelling in my location, the ferries sounded their horn signalling the start of the race. But I hadn’t reached the start line yet! I thought I must have been mistaken and then realised the race had started without me. Time to get my skates on. 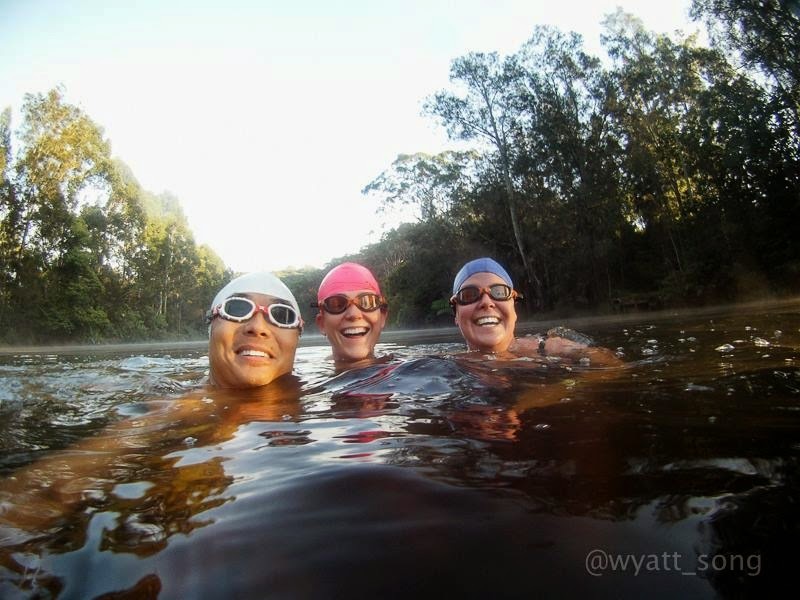 The water was about the 12.5 – 13.5 degree mark I’d been training in so it was surprisingly easy to get into a rhythm. That sun came out (thanks Simon) so breathing right (towards the Golden Gate) got surprisingly glary. 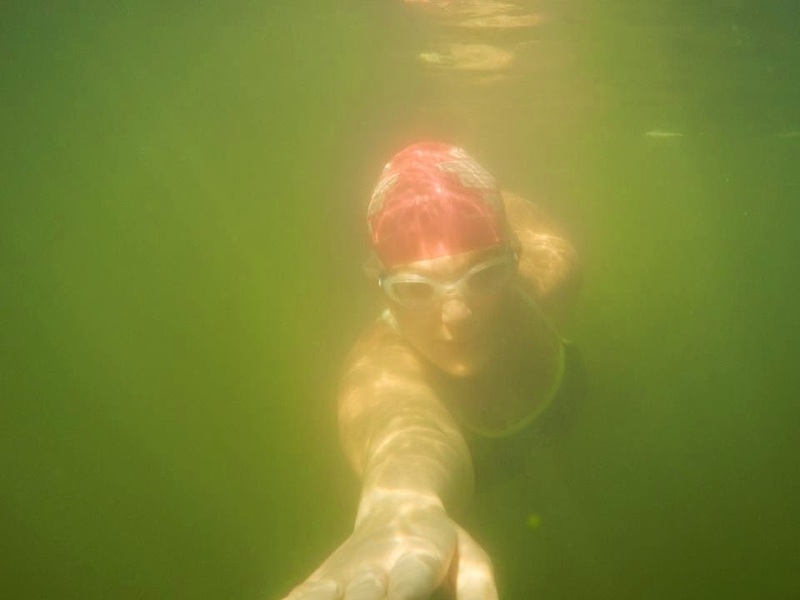 This swim was just an amazing, incredible opportunity that I absolutely savoured. To my left was the Bay Bridge. To my right was the Golden Gate. Ahead of me were the sights of San Francisco (transamerica tower, telegraph hill, aquatic park, fisherman’s wharf) and behind me was Alcatraz (I admit- I did backstroke at one point to take it all in). It felt slightly surreal after so long in the planning. On 11 December 2012 I pull the call out for interest amongst 4SEASons, including to visit Alice and Nina who had both moved to SF. 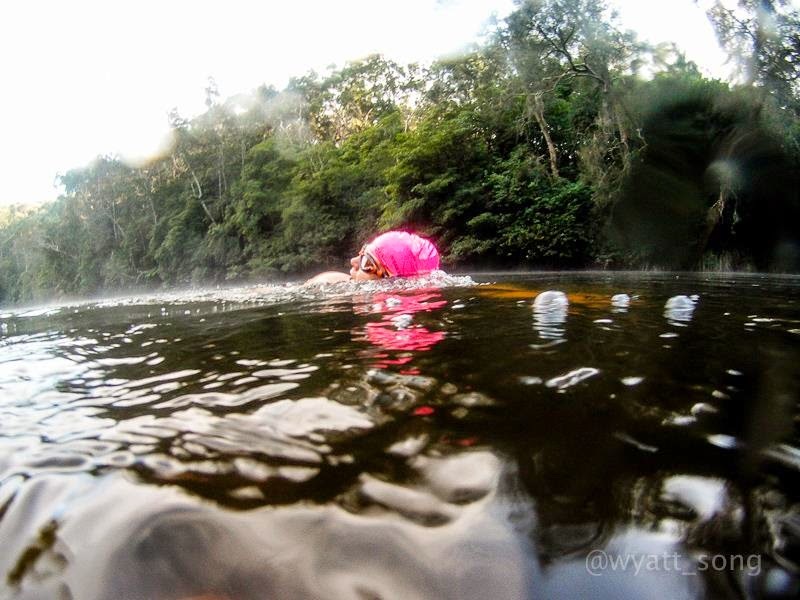 This swim was a long time in the making and I was determined to make the most of it. 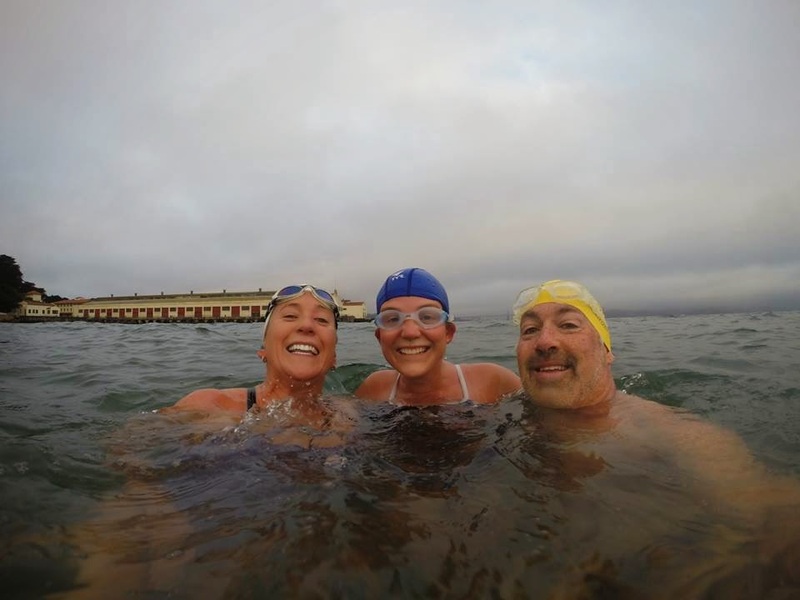 We left on the end of the flood tide, swam across the slack and hit the start of the ebb (when it warmed up to 15 degrees. Balmy bathwater! – It quickly returned to your regularly forecast coldness). Thanks to Gary Emich’s great guide to escaping from Alcatraz (available from the Alcatraz gift shop) I knew exactly what to sight for which tide and lined myself up with the (surprisingly narrow) entrance to Aquatic Park with ease. I got caught in a cross current for a little bit (nothing on B2W) and slowed down. But I was super pleased with my performance overall. Sprinted across the line. Got told to stop sprinting. First and last time I’ll ever be called a sprinter. But one does not simply stroll across the finish line. It’s unseemly. Alice was there with camera at the ready, warmed towel and the best damn hot chocolate ever. Managed to warm up enough to cheer Jacki over the line before heading for a well-earned sauna and hot shower. Two Bondi lifesavers aren't so fazed about there being no lifeguards. Thanks Alice! 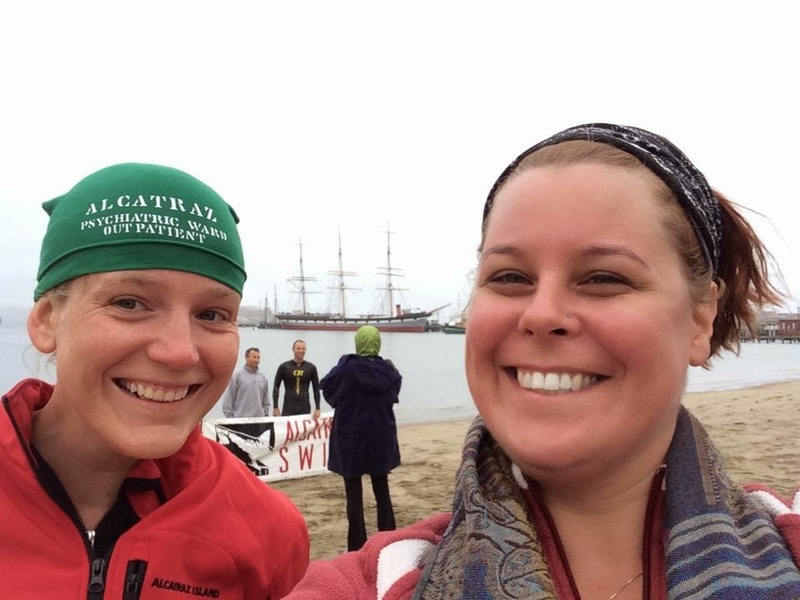 Now to swim around Alcatraz!